At ArtFactory.com we believe in building furniture that is not something that you just use for a few years and then throw away. Building items that are disposable is a practice that is unique to the past hundred years. In the old world, when a piece of furniture was built, it was built from solid, natural materials by master craftsmen. Most importantly, it was built to last forever. Something like a solid wood bed would be passed down through a family for generations. With this Louis XIV Style hand carved chairs, we have carried that tradition of built to last craftsmanship into the 21st century. A true modern masterpiece inspired by a 300-year-old design, with Louis XIV inspired floral carvings. Like all of our historically inspired designs, it is built with period correct methods and materials.This type of product cannot be build overnight, or with low quality materials. That is why used the highest quality, full length, solid cedar cypress (all wood types are available). It is built by hand, using the age old, tried and tested method of mortise and tenon joinery. This type materials and construction makes for a product that will stand the test of time. Most importantly, the floral acanthus motif carvings were done by the hands of one master carver. Direct carvings by one masters hands is especially relevant in the eyes of appraisers when determining a piece as meeting fine art qualifications. The Louis XIV style hand carved chairs are available individually or as part of a complete set that includes our French style hand carved king bed (CFB208). This set also includes available matching armoire, dresser, and nightstands. In fact, if it were not for these artifacts, it would be impossible to know these people ever existed, how they were important to history. This is also the case in the 21st century within your own family. No matter if it's a simple, hope chest with your personal message or name as a gift to a loved one, or extravagant, fine art quality, master hand carved chairs, these items will be important to the story of your family history long after you are gone. Our combination of the finest all natural materials, and master hand craftsmanship allow for us to offer a quality of product that is unsurpassed anywhere else, at any price. This is not only an investment quality piece, and an appreciable asset that will add to your financial net worth. In the eyes of your family, it will become a cherished heirloom and a priceless piece of immortality that will be tangible for generations. It will serve as a way to celebrate your life, and its direct effects on who they are, and what your influence was on your family's history. True artifacts enhance and enrich all of our lives in a way that mass-produced merchandise never will, thus preserving the best of mankind and expressing our love for each other. We have the ability to custom create the design of your dreams, with unlimited possibilities. 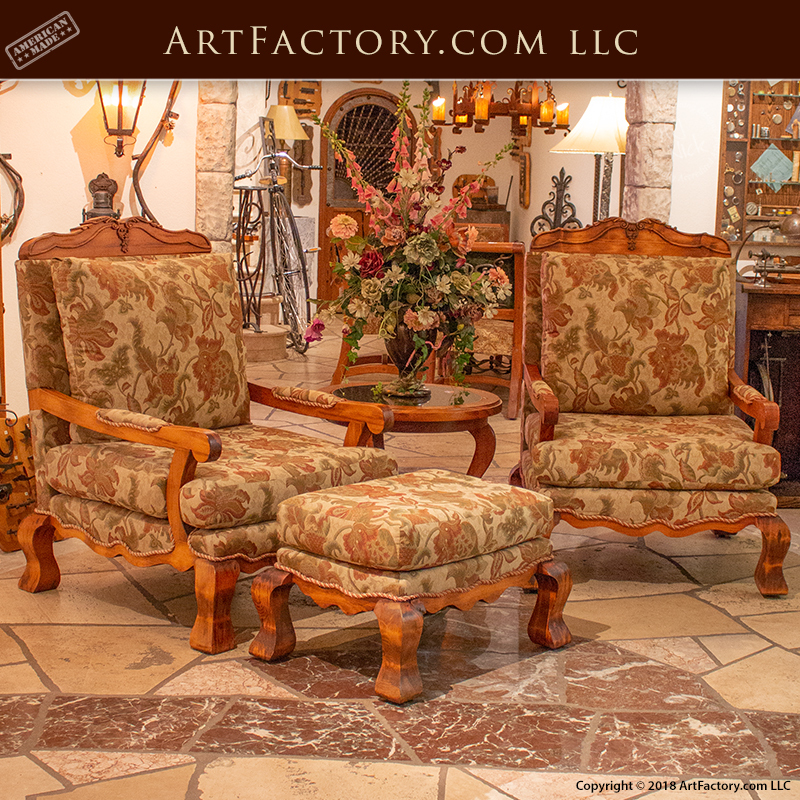 These Louis XIV Style hand carved chairs were designed in conjunction between the customer's design, and design department. It is a prime example of our ability to create even the most extravagant custom designs. These custom arm chairs are upholstered with the highest quality, high thread count fabrics. Additionally, with an 8-way, hand rag, and Tedlar tied seating system, these will be the most comfortable chairs you have ever sat in. The true definition of a lounge chair that is fit for a king We can create a whole room, or even a whole house full of matching furniture for you in any style. The magnificent hand carved chair backs, solid wood frame, and meticulously crafted decorative style chair legs are the work of our world class design department, and in house senior engineers. All of our products are designed and built under the direction of award winning artist H.J. Nick. Every product is signed and certified as world class fine art quality by H.J. Nick, before it leaves our world class factory. This type of certification ensures that your product has appreciable value in antiquity as fine art. The Louis XIV Style hand carved chairs were inspired by an 18th century design. The intricately detailed high relief carvings on these floral motif designer arm chairs were painstakingly done by the hands of one in house master carver. At ArtFactory.com, all of our wood carvers are classically trained in the old world methods of fine art carving. To be recognized as certified fine art, all carvings must be in the same hand technique. That is why our products are never gang carved, or CNC machine carved. These hand carved chairs meet all of these qualifications. Furthermore, our carvings contain both positive and negative reliefs, a result that cannot be achieved by any machine. The meticulous finish has been done in the age old technique using a 23-step hand rubbed process beginning with fine hand sanding, and infused hand applied stains. This allows for the highlights on the reliefs to show to perfection. There are then 20 additional steps requiring the application of wax, oils and lacquers with curing times between each process. This is done on all wood surfaces inside and out. This is the type of detailed required in the making of a one-of-a-kind, family heirloom bed that meets world class investment quality standards. In other words, a true fine art appreciable asset. Our in-house master wood workers and blacksmiths handcraft all custom furniture to your design specifications. We only use the highest quality materials. All of our wooden furnishings, doors, and gates are made from solid, full length, naturally air dried timber. We believe in the quality of our products in craftsmanship so much that as result, our custom bedroom furniture and all of our products are guaranteed forever. Call now for a custom quote at 1-800-292-0008 and get started on your own Louis XIV style hand carved chairs or any other custom bedroom furniture. Like all of our products, these chairs were handmade in the USA, in our Scottsdale, Arizona factory. Style - modern, classic, contemporary, etc.